WASHINGTON—Taking the oath of office for his second term today, President Barack Obama joined thousands of supporters in the nation’s capital for traditional inauguration festivities that included a prayer invocation, a parade along Pennsylvania Avenue, and a ceremonial flyover of three combat drones. 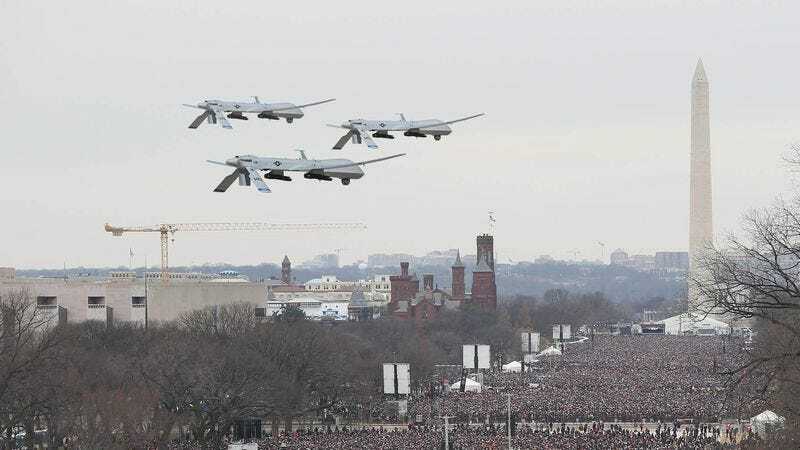 “When Obama was being sworn in on the Capitol steps, we could hear the drones screeching by overhead and everyone got really excited,” spectator Andrew Meyers, 34, said as he eagerly trained his eyes on the unmanned aerial vehicles that have taken out several hundred innocent civilians during presidentially authorized strikes in Pakistan and Yemen. “They go by super fast, but luckily there are Jumbotrons all over the National Mall, so nobody missed out. Wait, they’re coming back!” At press time, sources confirmed that inaugural celebrants were enjoying the Jumbotron’s live closed-circuit feed of the still-open prison facility at Guantánamo Bay.